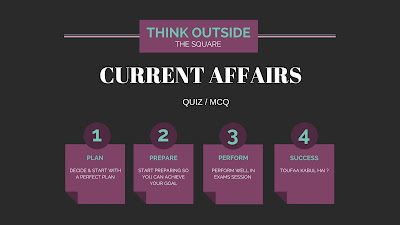 In our today's Daily Current Affairs Quiz - 2nd April 2018 we have included all the 15 questions which are very important for the upcoming examinations of Bank, Rail and SSC. These are very important and aspirants should practice them. Each question has proper answer and explanation provided. You may also like Current Affairs Updates and the Static GK and One Liner Note Down Points. These are not only important for the exams but can also help to boost your knowledge in General Knowledge sections. The National Association of Software and Service Companies (Nasscom) appointed Debjani Ghosh, former MD, Intel South Asia, as its President-Designate. Q2. Who has been appointed as the Director General Border Roads (DGBR)? Q3. Who has been appointes as the Deputy Collector in the state government? Indian shuttler Kidambi Srikanth met with Andhra Pradesh Chief Minister N Chandrababu Naidu was appointed as a Deputy Collector in the state government. Q4. Who has been appointed as the Deputy Election Commissioner? Senior bureaucrat Chandra Bhushan Kumar has been appointed as Deputy Election Commissioner as part of a major bureaucratic reshuffle effected today by the government. Q5. Who has been appointed to become the first woman to head UN political affairs? Long-serving American diplomat Rosemary DiCarlo was appointed to become the first woman to head UN political affairs, one of the most high-profile positions at the world body. Q6. Who is the president of Costa Rica? Q7. _________________ started is about to commence its banking operation. Jana Small Finance Bank (formerly Janalakshmi Financial Services) announced commencement of its banking operations. The Union Cabinet chaired by Prime Minister Shri Narendra Modi has approved signing of the Memorandum of Understanding (MoU) between India and United Kingdom and Northern Ireland regarding cooperation and Exchange of Information for the Purposes of Combating International Criminality and Tackling Serious Organised Crime. Q9. Which International Airport has been adjudged the cleanest airport in the country? In the survey conducted across 53 airports in the country by AAI, Mangalore International Airport has been adjudged the cleanest airport in the country. Q10. Who is the first largest mobile phone producer in the world? Q11. Which is the top city in the short-term Momentum Ranking of JLL’s annual global survey? Hyderabad has been ranked the top city in the short-term Momentum Ranking of JLL’s annual global survey. Q15. The 72nd Santosh Trophy was held in ___________ stadium.